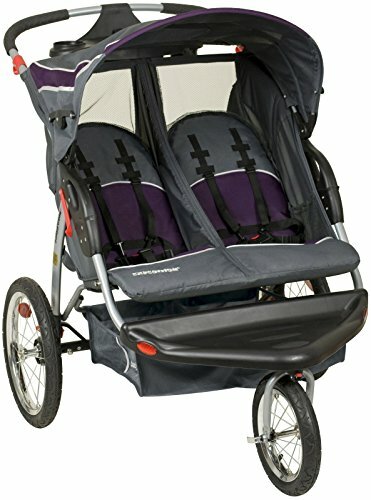 The Baby Trend Double Jogger in Elixer is a great option for parents who have twins. With the locking front swivel wheel, it makes maneuvering much easier and includes pneumatic bicycle tires. The ratcheting shade canopy provides shade and comfort. A convenient parent tray includes two cup holders and covered storage compartment. The parent tray also includes MP3 speakers plug-in in parent tray, compatible with most MP3 players; and compatible with most Apple iPod models and Apple iPhone. Convenient features also include a large storage basket, multi-position seat recline and quick and easy compact fold. For safety, a 5-point safety harness will keep your child secure while on the go. This product is JPMA certified. It is highly recommended that the children are at least 6 months of age up to 50 pounds or 42". If you have any questions about this product by Baby Trend, contact us by completing and submitting the form below. If you are looking for a specif part number, please include it with your message.